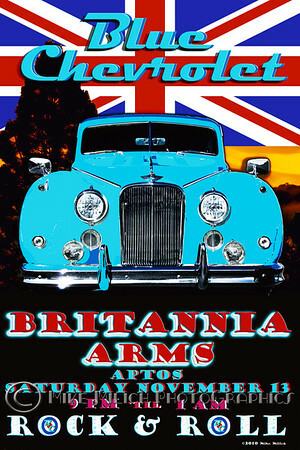 First of the composite Blue Chevrolet posters, and the first appearance of the logo based on the RAF emblem. A little clumsy, but effective. The1956 Jaguar MK VII was photographed at Rods at the Beach in Santa Cruz, CA. The Jag was a gorgeous pearl white. Made it ugly blue, pasted it on a sunset, put the union jack behind it and voila.